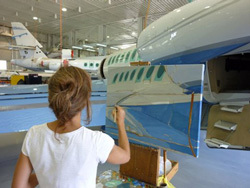 Rachel Lussier tests her artistic skills with unconventional subjects, such as a blue and white Falcon 50 at Duncan Aviation-Battle Creek last July. A wide array of visitors can be found at Duncan Aviation during any given week. Most are on site for business or education. We openly provide tours to local schools and programs and host time for many vendors and customers on a daily basis. But a very unique visitor landed in the Battle Creek hangars during a week in July 2010. Throughout that week Rachel Lussier was stationed near a blue and white Falcon 50. Rachel, an artist originally from the area, was back at Duncan Aviation for a second visit. Several years ago she began a journey to test her artistic, conceptual and technical skills by traveling around, choosing unconventional subject matter for her art. She chooses to work almost always from life and away from her studio. She describes her explorations as “art adventures”. If interested in learning more about Rachel and her work and to view more photos of her Duncan Aviation explorations visit her website at rachellussierart.com. Rachel has visited Duncan Aviation twice and we are honored that she finds so much inspiration within our facility. Ironically, the Duncan family themselves are very avid art collectors, so the thought of professional art being created within the facility is rewarding. Rachel explains: “my hope is that my host(s) find as much sense of discovery and enjoyment as I do during these on-site work sessions. For me, art is as much about the journey as it is about the final destination. Sharing that journey, and struggle, is one of the enriching byproducts of such a collaboration". The employees at Duncan Aviation have definitely enjoyed the visits from Rachel. During her last visit she was even prodded for advice by the nine year old granddaughter of a Duncan team member. Needless to say Rachel’s kindness and love to inspire artistic ability shown through as she ended up setting up a small still life and lending the young girl some of her art supplies. Rachel’s work is stunning and with each visit she seems to grasp more and more the non-technical beauty of the subjects. In reflection of Rachel’s last visit, Battle Creek COO and General Manager, Tom Burt stated, “It seems that we all have a love for the art of aviation”. We welcome Rachel to visit Duncan Aviation any time and wish her the best of luck in all her “art adventures” to come.